I’ve thought better of the Oktoberfest at the Timonium Fairgrounds in Maryland this Saturday. Nothing against Maryland, goodness knows, but it’s just far, man. No, the thing to do when imbibing epic amounts of beer in celebration of crisp weather is to stay close to mass transit. Enter OktoBEERfest in Alexandria. 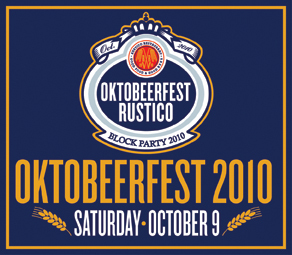 Just off Braddock Road Metro, Oktobeerfest is the brainchild of Rustico, a wood-fired-oven-type restaurant in the same family as Buzz, Birch and Barley and that symbol of pub-gastronomy, Churchkey. The event runs Saturday from noon to 6:00. Beer is a la carte, so bring cash. Also, if you take the Metro like a responsible day-drinker, take your picture in front of the Braddock Road Metro sign and receive a souvenir mug or tickets for food. It is going to be the most beautiful, perfect, joyful weekend on record, so make sure you’re outside. And if you’re outside, you should be at Oktobeerfest.